Heat oven to 400°F. In large bowl, beat powdered sugar, butter, vanilla and egg until light and fluffy. Beat in flour and salt until well blended. Fit cookie press with desired template. Fill cookie press; press dough onto ungreased cookie sheets. Bake 5 to 7 minutes or until edges are firm but not brown. Immediately remove from cookie sheets. Chocolate Spritz Cookies: Add 2 ounces melted unsweetened chocolate to powdered sugar mixture. Eggnog Spritz Cookies: Substitute 1 teaspoon rum extract for vanilla and add 1/4 teaspoon nutmeg with flour. 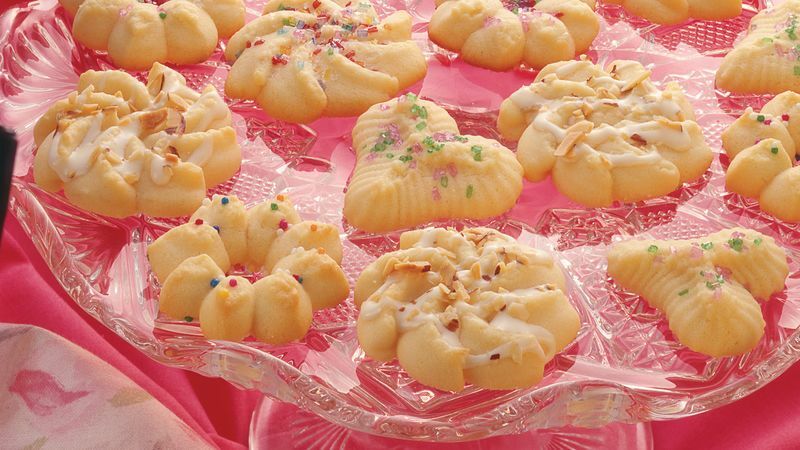 Orange Spritz Cookies: Add 1 tablespoon grated orange peel with flour.